As the weather has started getting warmer, our engines can become susceptible to spark plug fouling and hard starting when warm. As the ambient temperature increases, there is a resultant decrease in air density which can cause the fuel/air mixture to become too rich when the mixture control in in the full forward position during ground operations. 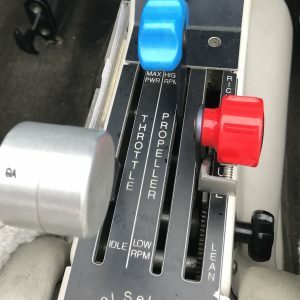 Normal leaning procedures inflight by the pilot are unaffected as the fuel injection servo automatically adjusts to the fuel mixture by calculating ram air pressure and density. However, when the engine is at idle speed (below 1200 RPM), the fuel injection servo is utilizing its idle circuit. This is the only maintenance adjustable part of the fuel injection system. When aircraft receive their routine maintenance inspections (100 hour or Annual), maintenance technicians set the idle mixture (to rise about 20 RPM) and the idle speed (approximately 650 RPM). Those adjustments work well when the aircraft operates in relatively similar ambient temperature and density altitudes for the next 100 hours. When we experience high-density altitude atmospheric phenomena – such as we enjoyed in mid-March this year, and as we roll into the Summer season – leaning during taxi prior to takeoff and after landing will greatly reduce the possibility of fouling one or more spark plugs. It is always a good idea to aggressively lean when taxiing. When engine power setting is low, there is no danger in damaging the cylinders from high temperatures like can happen at high power setting and leaning too far. Finally, it is good practice, before shutting the engine down, to increase the RPM to magneto check speed and check the magnetos. Then, shut the engine down right after returning to idle speed.